This is one of three lion photos produced this February. We have no shortage of lions on our 2000 acres. 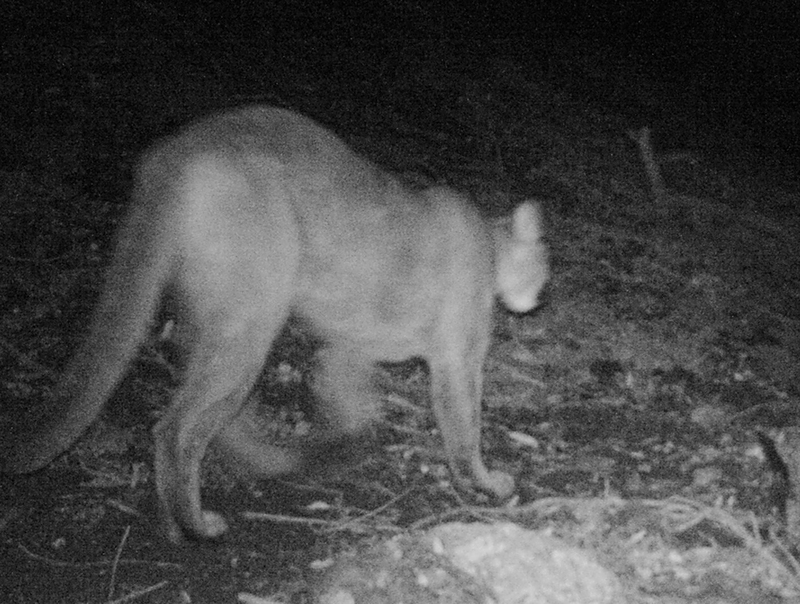 This and another of the photos were taken with trail cameras placed nearly two miles apart. This is typical. During the Western Hunting and Conservation Expo in Salt Lake City, The Mule Deer Foundation and Sportsmen for Fish and Wildlife sold a mule deer tag at their Friday-night auction on behalf of the state of Utah. Ninety percent of the proceeds from sale of the tag will be used to enhance mule deer habitat on Antelope Island, which is located in the Great Salt Lake. It is believed that this Antelope Island hunt will enable the purchaser to take down a trophy with antlers in the 240 – 270 inch range. The opening bid was $290,000 and the final bid was $310,000. My college roommate was a student of economics. He later became the controller of a large law firm. He has credibility with me, so I’ll relate a story from my college days. Bob came in from an economics course and explained the law of diminishing returns to me in this way. The first beer is the best tasting, and each beer after that is not only less tasty, but also has other negative effects. Thus the biggest bang for your buck, is the first beer. With each subsequent beer the cost per unit of enjoyment is higher. After deliberating the wolf conundrum for a while, I’ve concluded that this rule of economics can apply to wildlife management decisions and nowhere does it apply any more appropriately than with the gray wolf recovery. Even if species have no negative effects upon mankind, the rule of diminishing returns applies, but when species have negative effects upon society, by either threatening man’s possessions or inhibiting his peace and enjoyment, the returns on recovery are diminished at an accelerated rate. I’d claim this as a great discovery, but surely somebody has beat me to it. 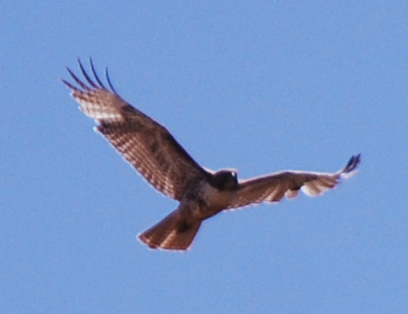 Normally we see red-tailed hawks soaring. This is a young red-tail. His tail will become red after he’s about 2 years old. Very seldom do we see dead red-tailed hawks. If we do, it is usually along side a road. Red-tails often hunt from a perch and there are plenty of perches along the sides of our country roads. If a hawk dives on a ground squirrel or other rodent, it may do so into a passing car. A couple years ago I collided with a red-shouldered hawk that way. My friend Joe checked out a road-killed red-tail recently and found it to be banded by the Golden Gate Raptor Observatory. This is a group that calls the Golden Gate National Recreation Area it’s home and bands birds of prey each fall. I apprenticed for them about fifteen years ago. It was a fun way to put my hands on a few hawks. You can’t get any closer while they’re alive. As unusual as it is to see a dead red-tail, it’s even less likely that you will observe a red-tail dying, but that is what I did a couple days ago. While walking along my usual hiking trail, a red-tail appeared face down just off the trail. Curious, I walked over and poked the bird with a stick. It moved. It appeared to be barely alive, but not wanting to interfere, I left it alone and checked on it again on my way back to the truck. At that point the bird was dead. 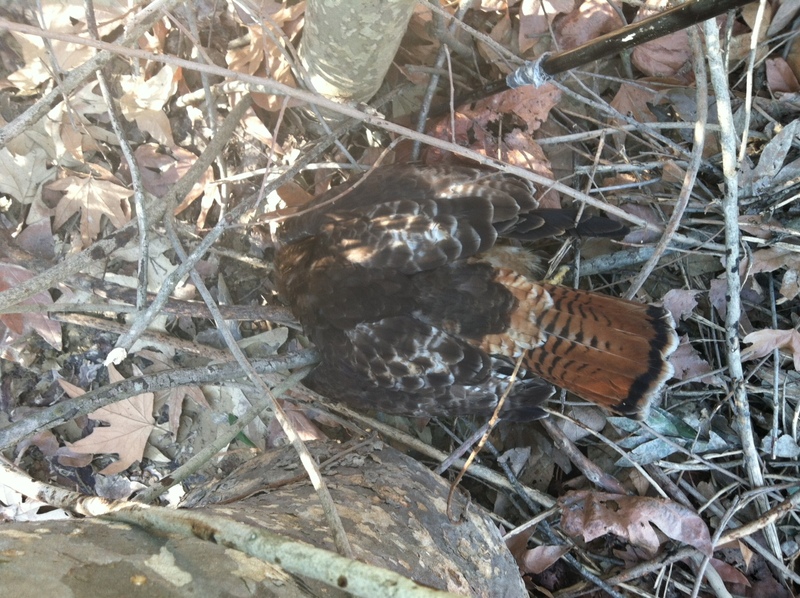 This hawk was dying when I found it beside a walking trail. I couldn’t help but wonder what had happened to this bird. It appeared to be a healthy bird, with all it’s plumage in place and no apparent wounds. Could it have died in a mid-air collision? Not likely. 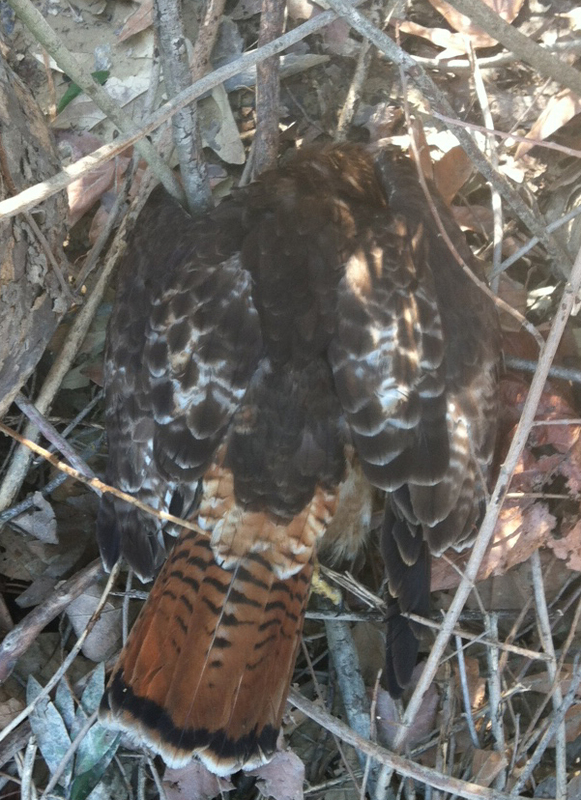 Could it have received a wound from a competing hawk? Small chance of that. When I spoke with my biologist friend, Joe, I asked him what he thought. That’s when he told me about the dead hawk along the side of Vasco Road. He added that the most likely killer of a mature red-tail hawk is secondary poisoning from rodenticides. Having observed the slow death of this hawk first hand, poisoning is logical. Who puts out rodenticides that can poison predators? Ranchers use rodenticides to kill California ground squirrels, so that is a possibility. Since this trail is near a golf course, I’d have to imagine that the greenskeepers might use rodenticides to kill gophers and ground squirrels that invade the fairways. It’s now common for marijuana growers to use rodenticides to kill rodents that attack their valuable crop. When it comes to the death of this red-tail at Del Valle Reservoir, my judgement is very speculative. I’m not a fan of rodenticides. Secondary poisoning is one of the reasons we don’t use them on our ranch. 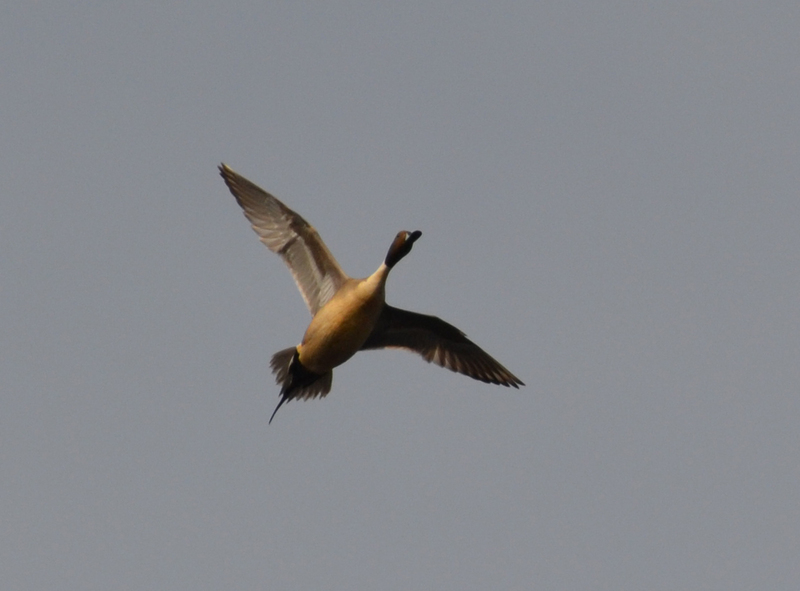 For the second year in a row, the action was modest for the late goose season. 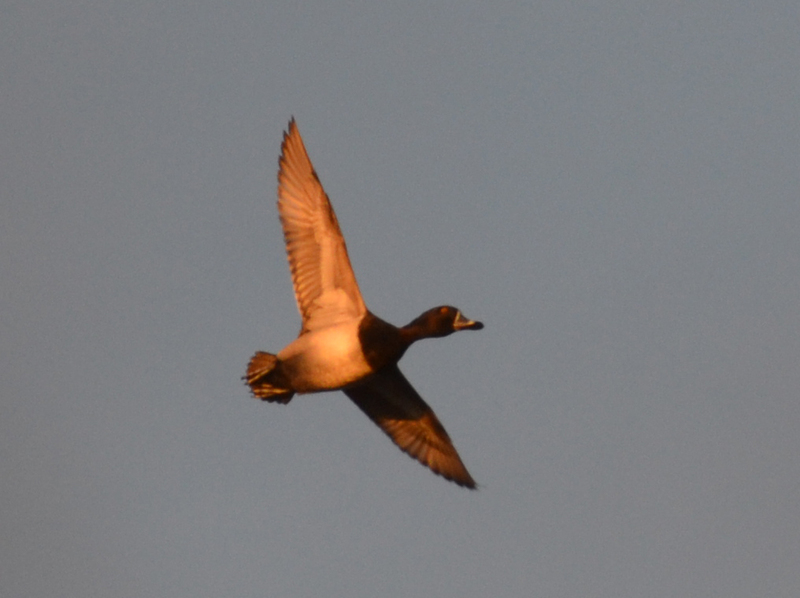 However the weather was gorgeous and the duck photo ops were excellent. Here are a few of the best. 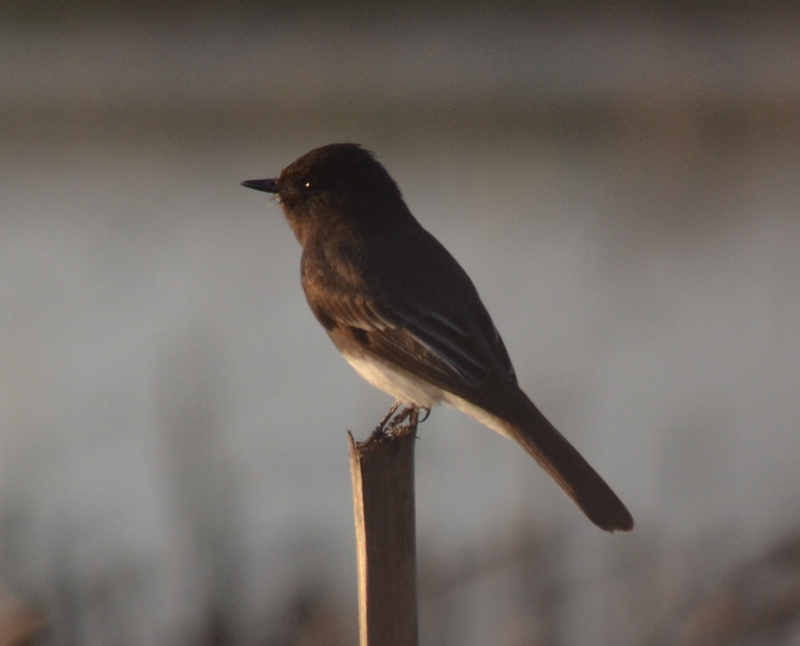 The black pheobe landed close. I know, its not a duck. This ring neck was moving fast. 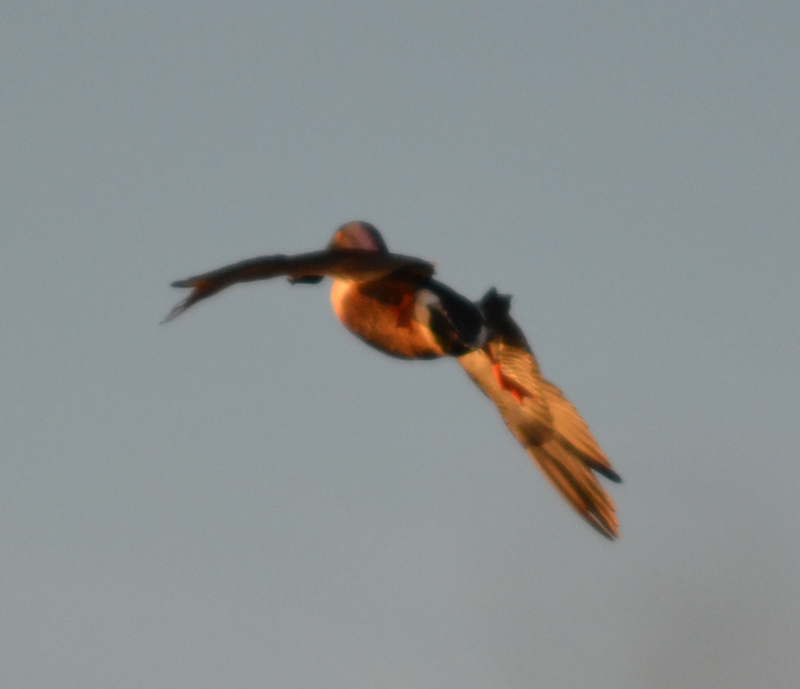 This spoony wasn’t as clear as some of the others, but I like the way his landing gear was down. This is my favorite of the day. Lola posed nicely with my lone spec of the day. 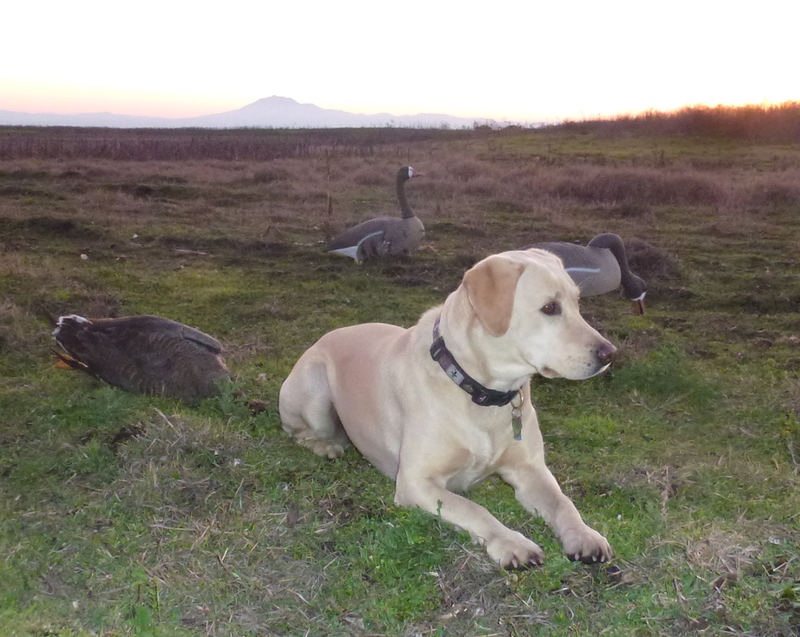 So once again the hardly-fired-up goose hunt was a success. It’s coming. On March 15 the Livermore-Pleasanton Chapter will hold its 21st banquet at the Robert Livermore Community Center in the Cresta Blanca room. Advance sales of tickets are underway. All aboard. We’ll be shoving off soon. After spending the afternoon with a gray wolf stakeholder group, I have concluded that California gray wolf management is a conundrum. First question: Why is it important to re-establish wolves in California? Answer: It is not very important. Second question: Why is it important to facilitate the successful rehabilitation of California wolf habitat to accommodate a stray wolf that has wandered into California? Answer: It is not very important. Third question: What problems do wolves create for California ranchers, conservationists and wildlife managers? Answer: Too many to list. Last question: Why are we holding meetings to make decisions about gray wolf management in California when there is only one known gray wolf in California? Answer: California politics are out of control and we are driven by a form of insanity, which is the result of guilt feelings (for all the evironmental destruction man has wreaked on the earth) and an out of control emotional attachment to iconic creatures – like wolves. I am a wolf fan and I will be thrilled when I see my first wolf and hope to have a wolf hide hanging on my wall some day, right next to a couple of coyote hides. You can bet that wolf hide won’t be from a California gray wolf. Here are four possible solutions to the gray wolf situation. The simplest and most cost-effective approach? Have the gray wolf classified as a varmint so that it can be eradicated. This solution is simple, painless, proven and cheap. It worked well for almost 100 years. End of discussion. If the simple, cheap, proven and painless solution is not acceptable, the second solution would be to work with the US Fish and Wildlife Service to create a recovery plan under the Federal Endangered Species Act. The recovery plan would establish management goals and create opportunities to fund activities like monitoring, study and mitigation for negative impacts to the species and its habitat. Hopefully, this would also create opportunities to manage other species, such as ungulates, that are critical prey species for wolves. But, I have to believe that the last thing the USFWS wants is to drag California into the already colossal fiasco that is taking place in Wyoming, Montana, Idaho, Minnesota, Oregon and Washington – so odds are that this will not be the approach taken. Another option is for California to take the lead in wolf recovery using a management plan as a guide. This option could create some problems by attempting to create a wolf program without proper funding. This approach would be particularly undesirable if wolves were delisted by the USFWS or is they make some type of formal decision that California is not important wolf habitat. The last option is for California to list wolves under the California Endangered Species Act (CESA) and use the California Environmental Quality Act (CEQA) as a tool to fund enhancement of wolf habitat and also habitat of related prey species. Land managers and conservationists could use the enormous power of CESA and CEQA to fund mitigation for habitat losses and compensate stakeholders who are negatively impacted by wolves. This type of action would prevent the creation of a (potenitally) huge unfunded mandate (option 3). And, politicians would be making the decision to go forward with a better idea of societal costs. Under this plan, wolves could thrive and so could their prey species. The complexity of this solution would be mind-boggling and also extremely expensive. Maybe that’s a reason for it to happen. Californians can’t resist the temptation to spend money – especially on iconic creatures. The best thing about this last option is that it could result in improved habitat for and boost awareness of the other species out there that share wolf habitat – like mule deer. Wouldn’t it be ironical if one stray wolf accomplished all that for California wildlife? Oh. There is another solution. California’s lone wolf (OR7) could go back home to Oregon and never come back. That would be nice. Now, having this off my chest, maybe I can go to bed and get some sleep.